Ask RP Photonics for any advice on phase-matching issues. For example, RP Photonics has software for calculating all possible phase-matching configurations for your device, and of all relevant parameters. where k1 and k2 are the wavenumbers of the fundamental and second-harmonic beam, respectively. Without chromatic dispersion, k2 = 2 k1 would hold, so that the phase mismatch vanishes. However, dispersion generally causes a non-zero phase mismatch (Figure 1) if no special measures (as discussed below) are taken to avoid this. Figure 1: Phase mismatch for second-harmonic generation. Due to chromatic dispersion, the wavenumber of the second harmonic is more than twice as large as that for the fundamental wave. This can be avoided, e.g., by choosing a different polarization in a birefringent crystal (→ birefringent phase matching). Figure 2: Addition of amplitude contributions from different parts of the crystal. Only with phase matching, a high conversion efficiency can be achieved. Figure 2 illustrates how a phase mismatch keeps the efficiency low. Here, the arrows illustrate the phasors corresponding to the complex amplitude contributions from different parts of the nonlinear crystal to the harmonic wave. Only when phase matching is achieved, these contributions add up constructively, and a high power conversion efficiency is achieved. Otherwise, the direction of energy transfer changes periodically (possibly thousands of times during the passage through the crystal) according to the change in the phase relation between the interacting waves. The energy then oscillates between the waves rather than being transferred in a constant direction. The effect on the power conversion is illustrated in Figure 3. 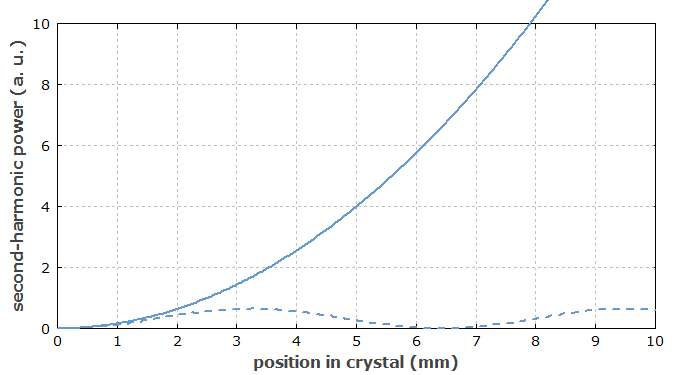 Figure 3: Growth of second-harmonic power in a crystal along the propagation direction, assuming a constant pump intensity. Solid curve: phase-matched case, with the power growing in proportion to the square of the propagation distance. Dashed curve: non phase-matched case, with the second-harmonic power oscillating between zero and a small value. In a frequency doubler, the direction of energy transfer is governed by the complex phase of the term E12 E2*, where E1 is the complex electric field amplitude of the fundamental wave and E2 that of the second harmonic. The asterisk indicates complex conjugation. The phase-matching condition k2 = 2 k1 implies that the phase of the term E12 E2* remains constant along the propagation direction. For a sum frequency generation process, or in a nondegenerate optical parametric oscillator, the corresponding term would be E1 E2 E3*, and the phase-matching condition would be k3 = k1 + k2. For devices such as frequency doublers or optical parametric amplifiers, phase matching needs to be actively arranged. On the other hand, an optical parametric oscillator may automatically choose its signal wavelength so that phase matching is achieved. Wavelength tuning can thus be achieved by influencing the phase-matching conditions e.g. via temperature changes or angular adjustments. When the crystal temperature is varied around the optimum point, the phase mismatch and thus the conversion efficiency also vary, as shown in Figure 4. The temperature range in which a high conversion efficiency is obtained is inversely proportional to the crystal length. It also depends on the temperature dependence of the refractive indices involved. Similar relations apply to other nonlinear frequency conversion processes. 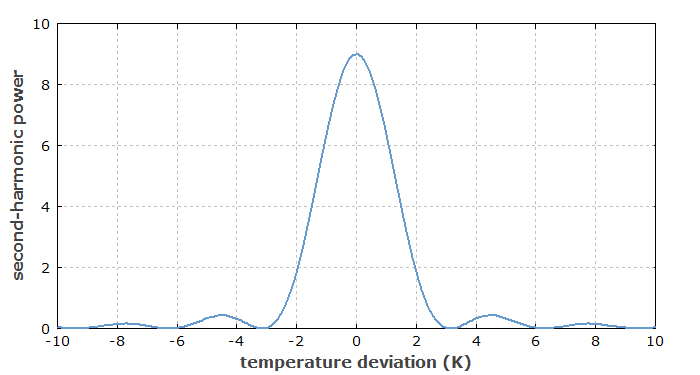 Figure 4: Second-harmonic power versus temperature deviation from the optimum point, assuming a homogeneous temperature distribution in the crystal and a constant pump intensity (low conversion efficiency). Similar curves are obtained e.g. for critical phase matching when the angular orientation of the crystal is varied. 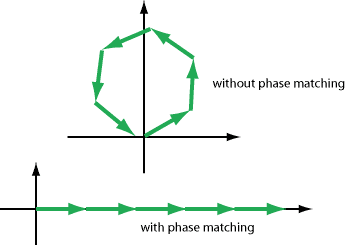 The phase-matching curve actually does not need to be as symmetric as shown in Figure 4. For example, it becomes asymmetric if the crystal temperature is lower at the crystal end faces, as compared with the middle of the crystal. It is possible to quantify the temperature homogeneity in a crystal oven on the basis of the measured phase-matching curve. Based on such data, it can be estimated whether the conversion efficiency could be increased e.g. by using a longer crystal. Type I phase matching means that, e.g., in sum frequency generation the two fundamental beams have the same polarization, perpendicular to that of the sum frequency wave. Conversely, in type II phase matching, the two fundamental beams have different polarization directions; this can be appropriate when the birefringence is relatively strong (overcompensating the dispersion in a type I scheme) and/or the phase velocity mismatch is small. The distinction between type I and type II similarly applies to frequency doubling, and to processes such as degenerate or nondegenerate parametric amplification. The different polarization arrangements can have various practical implications, for example for the combination of several nonlinear conversion stages, or for intracavity frequency doubling. Critical phase matching means that an angular adjustment of the crystal (or the beam) is used to find a phase-matching configuration, whereas in noncritical phase matching all polarization directions are along the crystal axes, and the angular position is then not a sensitive parameter. The wave vector of all involved beams may have the same direction (collinear phase matching) or different directions (noncollinear phase matching), where, however, the vector sum of the generating beams equals the wave vector of the product beam. A special case is achromatic phase matching where at least one of the interacting beams is angularly dispersed so that each frequency component of the signal is properly phase-matched. A special technique of significant importance is quasi-phase matching, where real phase matching does not occur, but high conversion efficiencies are nevertheless obtained in a crystal where the sign (or strength) of the nonlinearity varies periodically. Such a periodic variation of nonlinearity can be achieved e.g. by periodic poling. Normally, one then has equal polarization states of all involved waves (as the birefringence is not needed), and this configuration is sometimes called type-0 phase matching. When phase matching is achieved, the group velocities of the interacting waves are in general still not matched; there is a certain group velocity mismatch, which limits the interaction length for pulses and (for a given interaction length) the spectral range (called phase-matching bandwidth) in which phase matching is achieved. Also, there is only a finite range of beam angles where phase matching works – particularly for critical phase matching. This range of angles is usually called the angular phase-matching bandwidth. See the article on phase-matching bandwidth for more details. For any given crystal and nonlinear interaction (characterized by the participating wavelengths), there may be multiple phase-matching configurations, the comparison of which involves a number of important properties. Which configuration is most suitable, can depend strongly on the application. An example is sum frequency generation in an LBO crystal, where two inputs are 1064 and 1535 nm generate a red output at 628 nm. For this interaction, there exist three critical and two noncritical phase-matching schemes, considering only collinear phase matching. Also, the cases with critical phase matching are restricted to a crystal temperature of 20 °C. These schemes are listed in Table 1. Table 1: Various phase-matching schemes for sum frequency generation in LBO. As an example of the nomenclature, the critical scheme XZ I(ee-o), θ = 88.0° means that the beams propagate in the XZ plane with an angle of 88.0° to the Z axis. Both inputs have extraordinary (e) polarization (type I), whereas the product wave has ordinary (o) polarization. As an example of a noncritical scheme of type II, take Z / XYX, where the beams propagate in the Z direction and are polarized in the X (1535 nm), Y (1064 nm), and X (628 nm) directions. It is important to realize that the choice of phase-matching configuration also influences the effective strength of the nonlinearity, because it determines the directions of the electric fields involved with respect to the crystal axes. There are configurations which would offer, e.g., a large gain bandwidth but are hardly usable since the effective nonlinearity would be very weak. In principle, the noncritical scheme X / ZZY should offer the best performance, having the highest nonlinearity and no spatial walk-off. However, the critical scheme XZ I(ee-o) is actually very similar: starting from the noncritical scheme X / ZZY, one just rotates the crystal by 2° in order to get phase matching at 20 °C instead of 13.6 °C. The walk-off is very weak, as the beam direction is close to the X axis direction. In the case that a type II scheme is required (e.g. when the input beams are already collinear but have orthogonal polarization directions), the scheme YZ II(eo-o) might be considered, even though the lower group velocity mismatch of scheme XZ II(eo-e) could be slightly more advantageous for ultrashort pulses. The group velocity mismatch (GVM) e.g. between some pump and signal waves can be important for the conversion of ultrashort pulses, as is related to the phase-matching bandwidth. Note that the GVM values vary considerably between different schemes, demonstrating that the choice of the material alone does not determine how important this issue is. For each particular phase-matching scheme, the optimum crystal length (particularly for ultrashort pulses) and beam waist need to be found. Obviously, it is very useful to have software which can systematically identify all possible phase-matching configurations for a given nonlinear interaction, based on, e.g., Sellmeier equations for the refractive indices of all involved waves. On this basis, the most suitable scheme can be selected, taking into account the specific requirements for the conversion device to be designed. Note that phase matching is in some cases further complicated by the Kerr effect: the resulting intensity-dependent refractive indices also make the phase-matching relations intensity-dependent, and this effect is sometimes significant, e.g. for four-wave mixing processes in fibers. Phase matching is relevant not only for χ(2) nonlinearities of nonlinear crystal materials, but also for other nonlinear processes. For example, χ(3)-based nonlinear interactions in fibers (e.g. parametric amplification or four-wave mixing) can be phase matched under certain conditions. Such issues are also of great importance in the context of supercontinuum generation. Some nonlinear processes are automatically phase-matched; an example is self-phase modulation, where all photons involved have the same wavelength.